. . . to transfer the atmosphere of the artist’s studio to the boulevard. Despite the physical fatigue factor from daily 40-minute afternoon drives and setting up to paint, I cannot describe how invigorating and inspiring the Waxahachie environment has become during this week of plein air activity. The enthusiasm of the artists coming and going out of Art on the Square at 113 W. Franklin St. is beyond description. And the residents of this town are so friendly, eager to approach our easels to see what we’re working on, and to offer kind words and express appreciation for us coming to town to paint daily. The skies turned dark over Waxahachie, threatening rain. I chose to set up my easel under the awning of the businesses on the west side of the town square. Measuring out a 9 x 12″ surface, I began carefully drawing out the details of the Ellis County Courthouse’s complex cupola. I worked slowly, taking several breaks, and got to renew friendships with other plein air artists I haven’t seen for over two years. 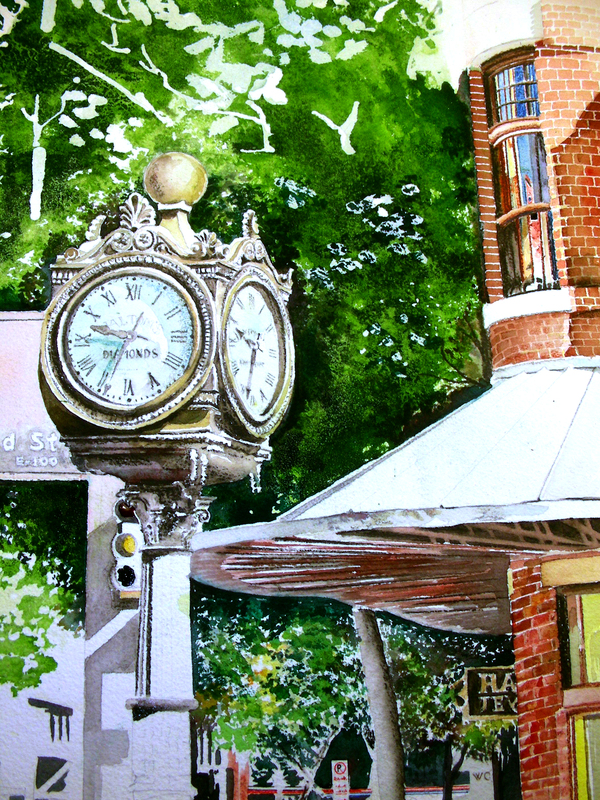 I’ve missed the recent seasons of Paint Historic Waxahachie, and cannot wait to reconnect with other artitsts I’ve had the pleasure of knowing in this area. And speaking of reconnecting–I have been unable recently to meet my friends at our weekly “artists cafe” gathering on Tuesday nights. So . . . this afternoon Kelly Noonan and Elaine Jary brought the cafe to me! They made the 40-minute drive to Waxahachie and we had an evening meal, drinks and rewarding conversation at the College Street Pub on 210 N. College Street. This has become my favorite place to decompress after a long afternoon of painting, and what could be better than chatting with kindred spirits. Thanks, Kelly and Elaine for bringing the Cafe Gerbois back to life in this century! And thanks to all of you who are following this activity. Thank you for keeping me inspired. Though a few days have passed, I still find myself lost in wonder, flooded with residual memories of the Edom Festival of the Arts. The weather was perfect, with mornings beginning in the low 70’s, and plenty of sunshine taking temperatures up into the upper 80’s. Midway through the first day, I turned around, and was caught by surprise at the sight of this tree behind my booth, flooded with color and light. I think I felt a tinge of what the French Impressionists experienced–that impulse that drove them outdoors with their easels to paint en plein air. 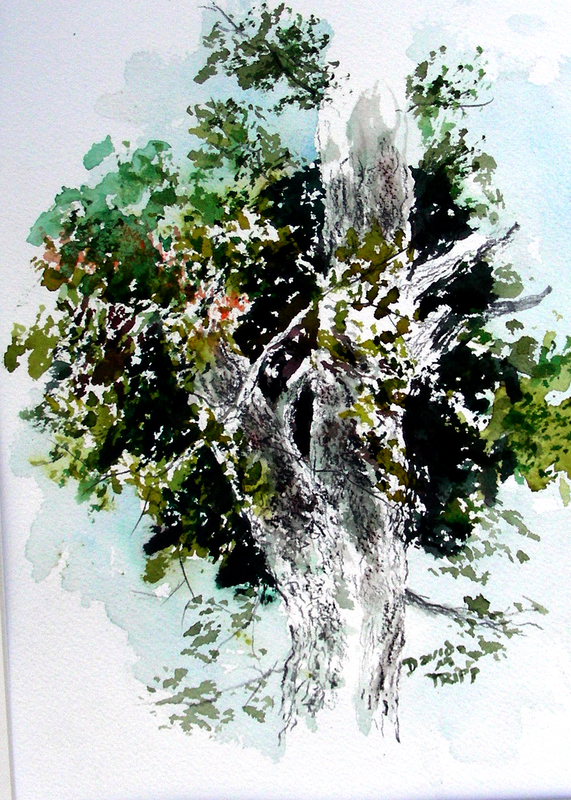 I set up my own Winsor & Newton easel and went to work, completing this on the first day of the activities. Painting out in the open, in public view, also affords conversations with curious onlookers, and thus opens up avenues for new friendships. I was enriched by that as well. The temperatures are falling in Texas. We reached the fifties this morning, and my Man Cave is cooling considerably this evening, with winds coming through the open door. I’m anticipating some rewarding ventures en plein air as our autumn runs its course. 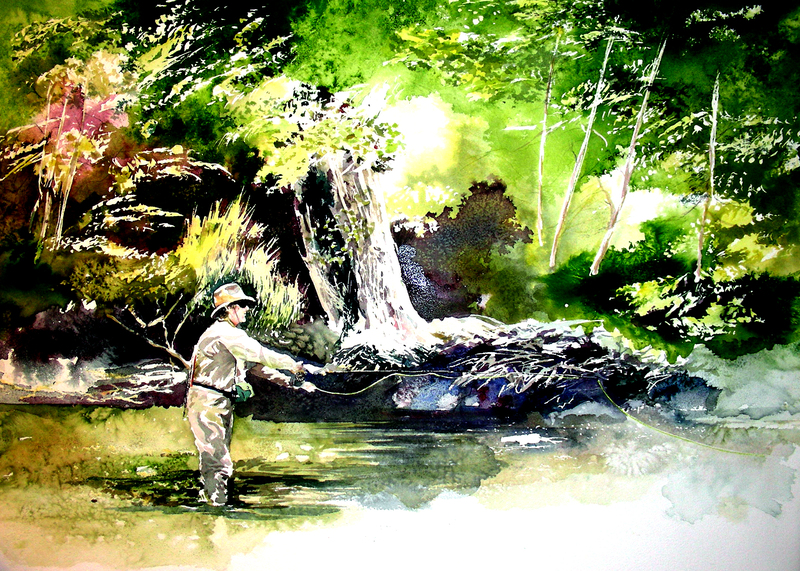 It took a number of years for me to work up the courage to watercolor a fly fishing composition. My wife took this picture of me fly fishing in South Fork, Colorado. I chose to pour this composition, masking out tree patterns and pouring pure watercolor pigment from bowls onto the soaked paper. Sprinkling salt and spritzing the drying pigments created a number of satisfying textures in the foliage as well as the surface of the stream. I am now counting the hours toward the opening of my One-Man-Show. Forty-two watercolors are in place at the Weiler House Fine Art Gallery (http://www.weilerhousefineart.com). The show opens Saturday night 5-9:00. This watercolor has been framed and is now hanging in the show. I’m proud that my friends get to see the painting at last. I’m deeply satisfied with the depths of colors and the effects created by the pouring technique. I’m trying very hard to have this watercolor wrapped up and delivered to the Weiler House Gallery by tomorrow (http://www.weilerhousefineart.com). The latest obstacle interfering with its successful completion is our air conditioning breaking down today. It is only 102 degrees outside now, meaning that the inside of my studio is a cool 90 degrees. I find this exceptionally irritating, especially since I called in our problem Saturday morning and it only took four days for someone to come and announce that the motor was nearly dead, and that ordering and receiving the replacement would take a minimum 48 hours–then 3 hours after he left, the motor gave up the ghost. 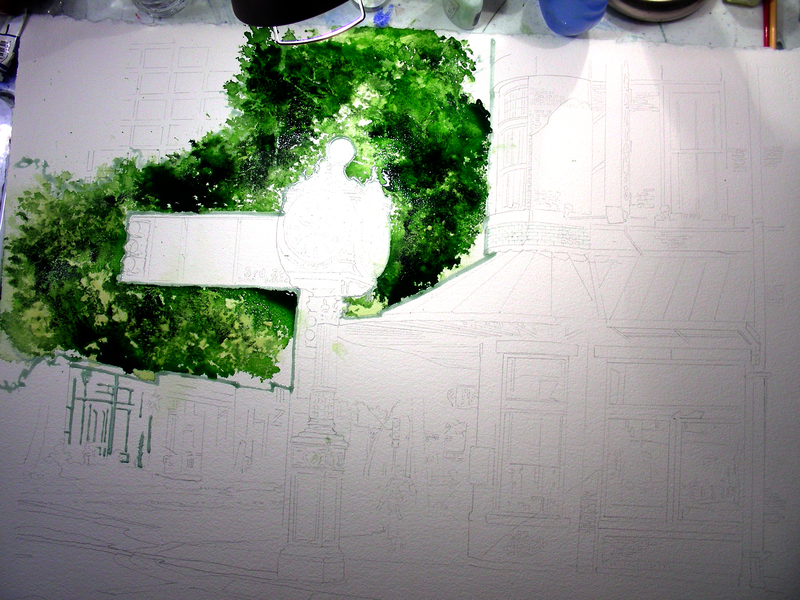 At any rate, I still hope to finish this tonight and deliver it tomorrow. I will take one final photo of the completed work. I hope all I need do is complete the downspout and vertical slice of brick facade running down the right side of the composition. Of course, if I stare at it long enough, I’ll no doubt find other things to do to it. Nevertheless, I’m sticking with my self-imposed deadline. Tomorrow, then. Thanks for reading, and especially for following up on this particular watercolor odyssey. It’s been an interesting path for me. It’s hard for me to take a decent digital photograph in the comparatively dim light of my studio as opposed to outdoors in the daylight. But I wanted to get this latest development out there on my blog. Thanks to those of you dear readers who always offer so much encouragement, and provide the impetus for me to continue, even when I am tired, or on the verge of burning out. 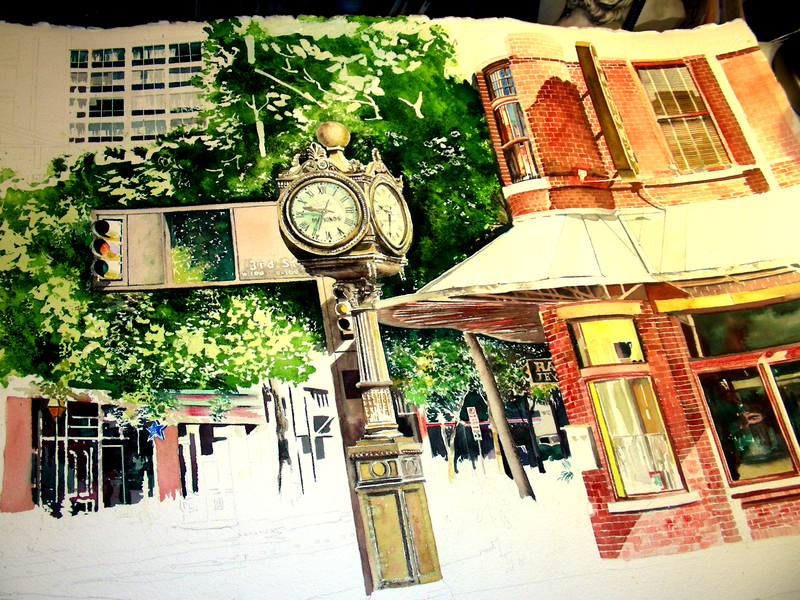 I was terrified of watercoloring this clock, because I had no clue as to how to mix the bronze colors (still don’t!). I’ve been using Aureolin as my base, with touches of Cadmium Red Medium and the occasional Winsor Green. For tighter work, I’m relying heavily on a Dark Sepia watercolor pencil (Albrecht Durer brand), and sharpening it frequently to create clean edges where I can. I’m just about finished with the monument. The major thing that remains now is heavy street shadows with all kinds of variation going on. We’ll see how they come along (probably tomorrow–I’m getting tired!). This morning, I rose bright and early, determined to go after this clock that I have avoided from the start. I spent about 30 minutes on it, then quit to work out at the health club. 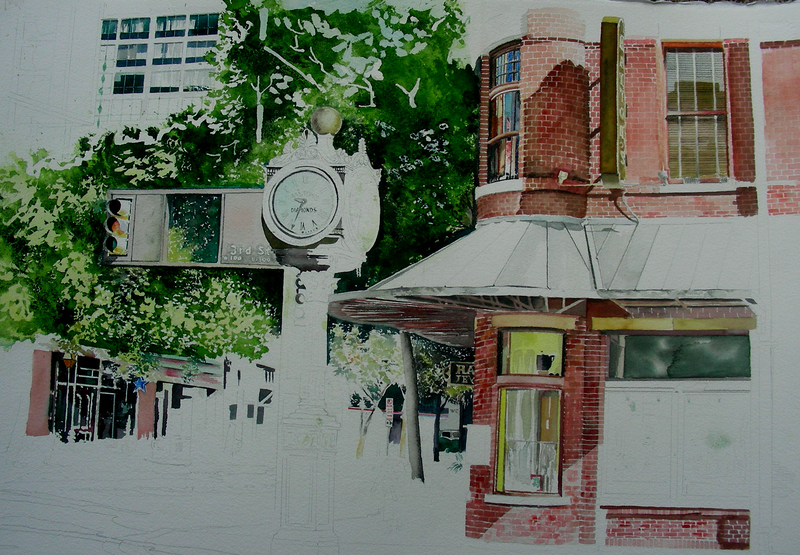 Returning, I labored over it again for about an hour, then quit again, This afternoon, I am chipping away at it yet again. My fear has been that the clock would melt into the background, so I keep backing away to study my reference photos taken on location, to get a good read of the surrounding contrasting colors. As I’m getting deeper and deeper into this painting, I’m aware of my tendencies to “choke,” as I fear doing something that will un-do whatever good work I laid as a foundation. So far, I’m pleased. 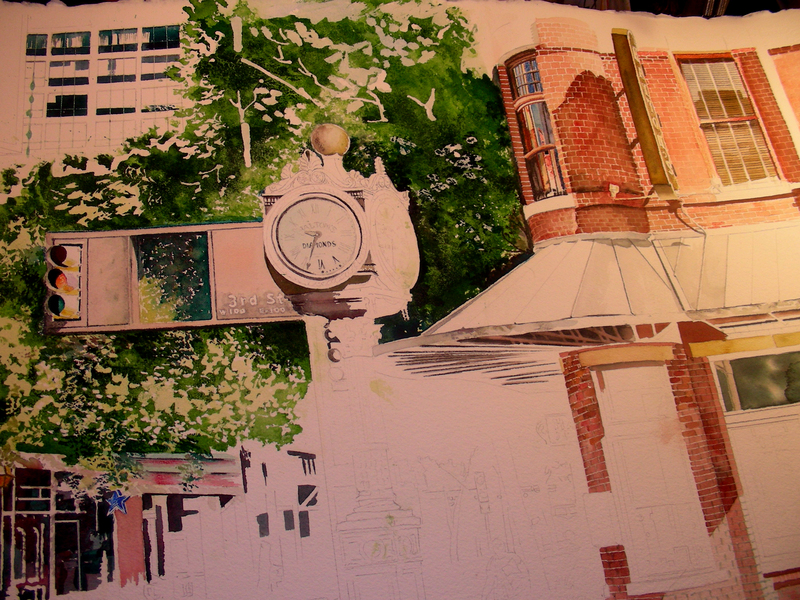 By now you have probably guessed rightly that I am terrified of painting this monumental clock. I’ll get to it, when I’m comfortable with it. Meanwhile, I pursue the endless details. I’ve heard it said that the Devil is in the Details, but I have always found the Sublime in the Details, at least when it comes to drawing and watercoloring. I get lost when this occurs, and I find it totally enjoyable. My breathing changes when I detail a watercolor just as profoundly as when I step into a mountain stream with a fly rod. Considering that Texas is facing yet another triple-digit temperature day today, I could wish to be wading a mountain stream, but oh well–I’m glad to be painting. I feel that an apology is owed my blog readers. 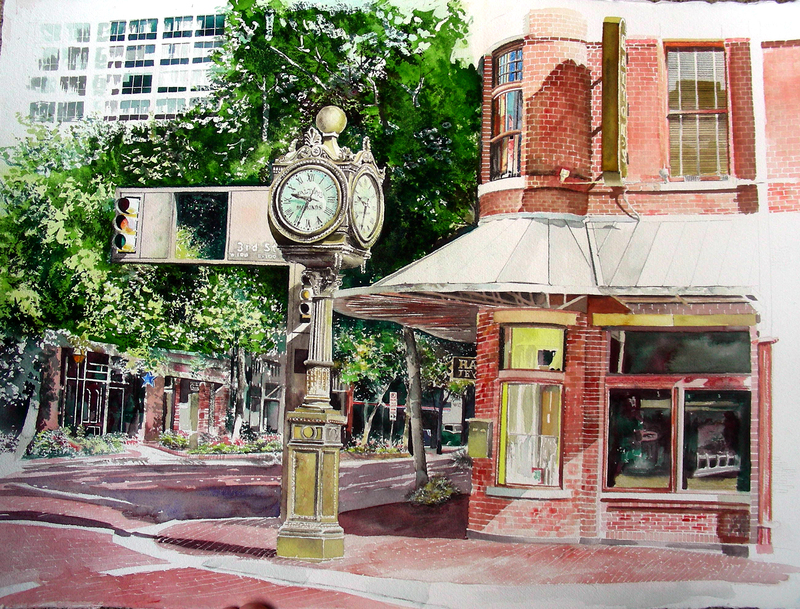 It has been several days since I’ve touched this watercolor, and therefore, posted on the blog. Several other details in my life have managed to crowd out my watercolor time. This is entirely my fault, as I’ve felt somewhat burned out on this piece for several days, and really hated to pick up the brush when my heart was not in it. I did get out yesterday evening to the Fort Worth Stockyards, north of town, and did a plein air piece of the historic Hotel Texas. The attempt was a disaster, as again, my heart wasn’t in it. I choose therefore not to publish that sketch. Tonight I put my best effort forward, and once again am beginning to develop an interest in this piece (particularly, to finish it!). I began work on the Worthington Hotel windows in the upper left corner, did some more pencil rendering of that magnificent clock, and darkened the background foliage to push the clock forward more effectively. Also I began work on the ground-story brickwork of the Jewelry store. Plenty of details are starting to get my attention. Hopefully tomorrow I can turn the wheel several more revolutions. Thanks for reading. It’s taken awhile to get started on this large piece (22 x 28″). I spent several hours yesterday, drawing out the composition. This afternoon, in the bloody hot garage (another triple-digit Texas temperature day) I poured my first layers of color onto the tree foliage (Aureolin and Winsor Blue). It took a few hours to dry. Now I have poured my second, darker layer (a combination of Sap Green and Cobalt Blue Deep), sprinkled plenty of salt, and then intermittently hit it with a spray mist bottle of water and added more salt. I’m afraid that is all I can do tonight. it is nearing 11:00 p.m., and I should probably give this all night to set up and dry before I strip away all the masking fluid underneath. I can’t wait to see how the beginning stages look tomorrow. the setting is Haltom Jeweler’s at Sundance Square in downtown Fort Worth. I spent two days there this past week, photographing, sketching and trying to make a decision on what to paint next. I knew I wanted to tackle a full size sheet of watercolor paper again. It’s been a few months since I’ve poured watercolor onto the page. I’ve missed that sense of dizzying freedom. I’m glad the Muse is stirring tonight. The 4th of July has turned out to be a decent day for painting. Once my thermometer reached 106, I decided it was time to get out of the garage and retreat to my indoor studio (I cannot bear the dim light of the indoors, once I’ve indulged in plein air, nevertheless I’m not inviting heat stroke either). It’s nice to work in an air conditioned place now. I began this small 11 x 14″ piece on the last day of class with my Eureka Springs School of the Arts group. It was Friday morning, and I felt a heaviness, knowing I was going to leave Eureka Springs and all its beauty that day, yet anxious in my heart to get on to the next appointment. I felt that great things were just ahead. 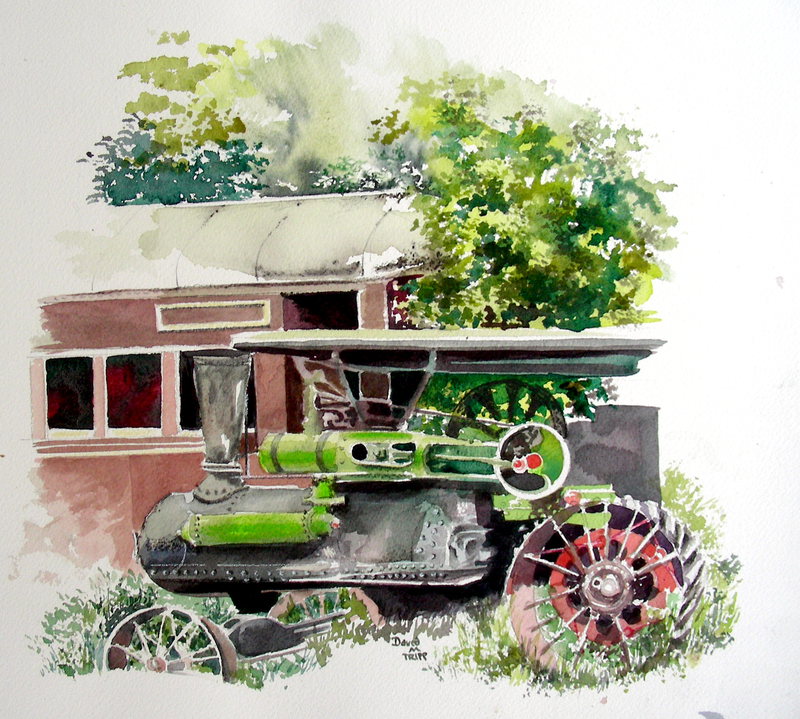 Once I took out this piece today, I realized that the antique steam engine really needed a set of wheels. So I fortunately had a reference photo taken on location, and set to work today trying to finish out the bottom of this composition. I’m glad to bring closure to this work. Again, I have too many conflicting feelings co-mingled, as this painting takes me back to the end of Eureka Springs and the transition back to life as I know it today. It has not been an easy shift, and I’m still working to get my feet back underneath me. I have filled out an application for the 2012 academic year at Eureka Springs School of the Arts, and hope I can return to this remarkable mountain town next summer. This quaint Victorian mountain town is a plein air artist’s dream.